You are here: Home / Nu-Art News / Happy Memorial Day Weekend 2018! 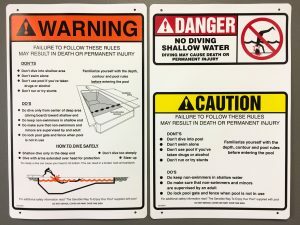 A few weeks ago, one of our great clients who specializes in pool liners and safety covers placed another order for custom safety placards, decals, and labels. Safety is paramount when it comes to swimming pools, either residential or public, and having those instructions clearly marked is extremely important. The Danger and Warning placards are printed on 16mil polyethylene. The Warning placard is two colors, printed using a UV screen printing process. 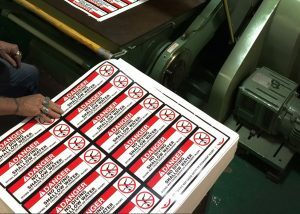 The Danger placard is also printed using the UV screen printing process, but with three colors. Both pieces are then die cut to create the rounded corners and four holes for use in securing the placards to the pool area. Also produced for this client were the Danger-No Diving decals. These were produced using a two color screen printing process. After printing they were back slit then put through a steel-rule die cutting machine to create the final shape. These custom decals and placards are durable, easy to read and will hold up under extreme weather and any other harsh conditions thrown their way. As we celebrate Memorial Day, we hope that you enjoy the day with family and friends. Be safe and follow the rules on our polyethylene placards, vinyl decals, and labels! But, most importantly, please take a moment to remember those who made the ultimate sacrifice while serving our country in the armed forces.